The U.S. Department of Homeland Security has sent out an urgent alert telling Windows customers to uninstall Apple’s QuickTime program. Apple has pulled support for QuickTime on Windows, the video and audio software that had once been widely used to play movie trailers and other Internet media clips. 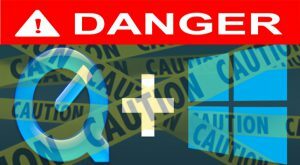 The company decided this week not to issue any more security updates for QuickTime on Windows, despite two major vulnerabilities in the software that can allow hackers into people’s computers.